Most of you haven’t heard of Dr. Diego Pineros but I originally interviewed him about three months ago, (long before I set up this website.) He is one the many genuinely nice people I have had the fortune to meet during this trip (and a great tour guide since he knows quite a bit about the history of Bogota). Today, I went back to visit him, at Clinica San Rafael, which is one of several facilities where he operates. The case for this morning was cancelled, but it was nice to catch up with Dr. Pineros, meet his residents (young future surgeons) and see the clinic itself. 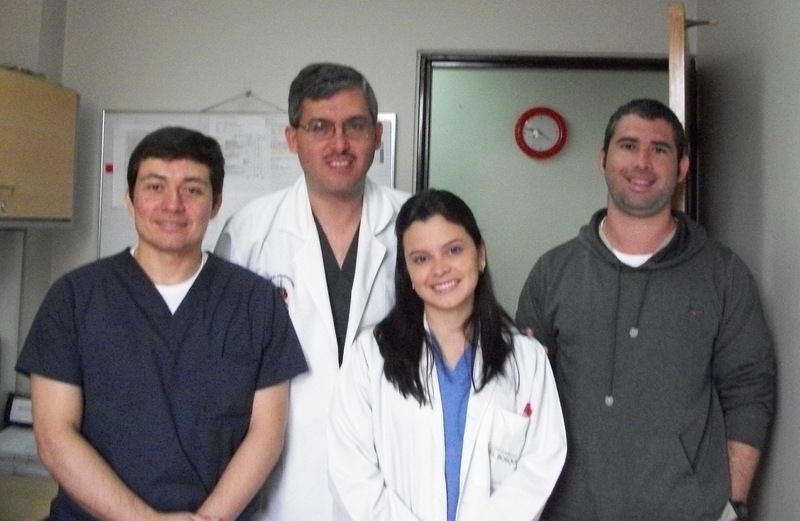 While we were there – we ran into Dr. Mario Lopez (thoracic surgeon) who has now added Clinica San Rafael to his roster. If you remember, we last saw him in the operating room at Mederi. I tried to get a picture of him (without his mask) but it’s a bit blurry..
Hope to be back at Clinica San Rafael soon, so I will be able to tell you more. This entry was posted in cardiac surgery, Colombia, Stories from the Front and tagged Bogota, cardiac surgeon, Cardiac surgery, cirugia cardiovascular, Clinica San Rafael, Colombia, Dr. Diego Pinero, Dr. Mario Lopez, heart surgery, thoracic surgeon. Bookmark the permalink. hi, we’ve been looking for Dr piñeros for a while! He performed an aortic cohartation surgery to our son 8 years ago (8 days old at that time) do you have his contact info? We would love to share some pics of our son playing hockey thanks to him.